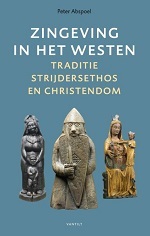 I do not often buy books spontaneously, but when my eye fell on a cover with an image of the Berserkr of the Lewis chessboard together with the words “zingeving” (literally: ‘giving meaning’) and “strijdersethos” (‘warrior ethics’) my attention was caught. It quickly became clear that this is not my ‘usual literature’, but it appeared that the author has something to say about the importance of tradition and the loss of it. I decided to take it home. The author is an anthropologist who spent much time in Africa. The subject of his investigations started to move more towards the West and Van Abspoel is of the opinion that he has such different view on certain developments in Western society, that he needed to write a book about it. The book is divided in three parts, “tradition”, “warrior ethos” and “Christianity”. In the first, the author explains what he means with the term “tradition” and what is it in his opinion. This part is interesting. Van Abspoel’s approach is somewhat ‘technical’ which brings another way of looking at the subject. There is a “non-reflexive” way of knowing that has to be transferred to the next generation in order to keep the world in sync with universal harmony. Then it comes. The author mostly uses Dumézil to say that Germanic society did not have a ‘first function’ and the entire society revolved around passion and blood-lust. The warrior class worked themselves up and became the “first function” in the scheme of Dumézil, the second were the farmers, the third the slaves. The Gods were warrior Gods and even the afterlife was all about fighting. Apparently Van Abspoel missed Odin’s role as a seeker of wisdom and that of magician. Where are Balder and Forseti? What about the Goðar and Völva? Even in the books of Dumézil the author could have found that Tyr and Odin are the Teutonic couple of sovereignty. Still, the author is of the opinion that the adventure seeking Germans were the reason that the West grew to be anti-traditional. The thesis and the way Van Abspoel supports it are interesting, but I cannot get my head around the fact that a substantial part of the book is based on a onesided theory and a onesided use of Dumézil. Rather than saying that Dumézil denied the existence of a sovereign “function” in Teutonic religion, Van Abspoel could have used Dumézil’s remark that the Teutonic pantheon ‘dropped half a function’ and that in society there was (indeed) a big role for the warriors, and worked from there. Now I do not believe Teutonic society was as bloody and anti-egalitarian as Van Abspoel describes it, but I may have been less annoyed by the founding of his theory based on half-read Dumézil. That said, the ‘furor Teutonicus’ (according to the author) made Germanic tribes disregard tradition, because tradition is about harmony, which would hold back the adventurous Teutons. This way of looking at life, resulted in our hasty society with little regard of the past and the constant rat-race modern man is part of. With the dawn of Christianity there initially was a return to a traditional way of looking at things (up until the Reformation). Van Abspoel describes how Jesus Christ did not so much try to do away with everything there was and replace it with a new religion, but rather how Christianity gave new color to certain traditions. Van Abspoel is a fairly ‘technical’ writer. Perhaps his book is meant for a scholarly audience rather than the general public. He founds his theories with many details and there are many repetitions and cross-references in the book. With an approach that was new to me and a theory that I cannot entirely follow, this makes the book quite a touch read here and there. The most interesting thing of the book, to me, is the way Van Abspoel approaches tradition and explains its importance, even in our own day and age. As you can judge from the title, the book is written in Dutch, so the audience will be somewhat limited. Perhaps this is a title that Dutch-speaking readers of this website may put somewhere on a ‘future reading list’. It is perhaps too scholarly and little ‘practical’, but one that may make you reconsider some of your own ideas and that is always a good thing.